It offers the ability to zoom in and out and move the cameras. Audi is attracting lots of attention for the mirrorless virtual side mirror system fitted to its E-Tron concept electric SUV. Now, two new videos give us a better sense of just how it works. Instead of conventional side mirrors, the battery-electric crossover offers 7-inch OLED monitors mounted inside the doors, just above the door handles. They're connected to rear-view cameras, which replace conventional side mirrors. The technology provides different angles and views for highways, street corners and parking. They're also more aerodynamic, which benefits driving range. 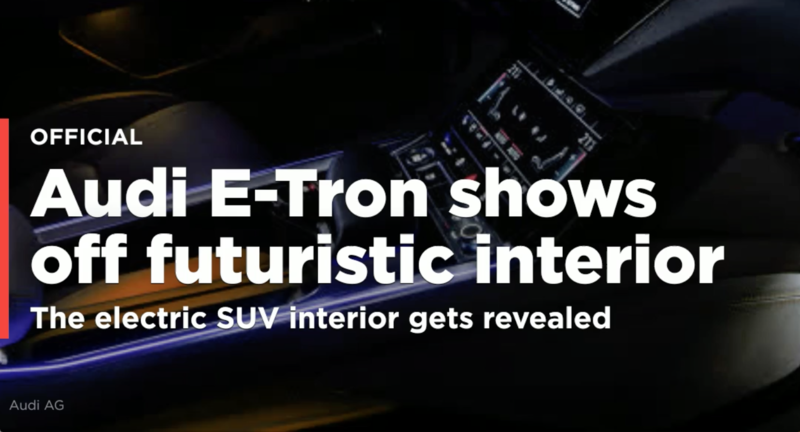 The folks at Auditography got a look at the interior of the E-Tron and shared it in a new video, above. The system is also shown in glimpses in a video Audi posted on Facebook showing the still-camouflaged SUV zipping around Copenhagen, which we've embedded below. The trapezoidal screen presents the driver with several options to adjust the view, and you can drag the image around to adjust the camera. The driver also apparently has control of the passenger-side camera.In its press materials, Audi says the system provides comfort and safety benefits: "The driver can enter different setting using the touchscreen function. The image detail can be moved, providing the required field of vision, while the user can also zoom in and out of the image. The driver can choose from three views in the MMI system for different situations — for highway driving, for turning and for parking." Audi originally planned to launch the E-Tron during the Audi Summit Aug. 30 in Brussels but now plans to launch it in the U.S. at a yet-to-be-determined later date. It goes on sale in Europe by year's end.